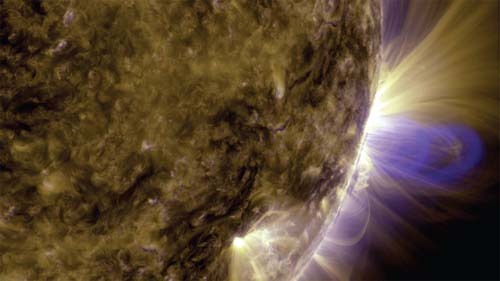 Solar flares are sudden, powerful explosions on the surface of the Sun. They usually occur when large, powerful sunspots have their magnetic fields too tightly twisted and torqued by the hot, swirling plasma in the Sun. The magnetic field lines unwind and break suddenly, and the matter and energy that had been contained rushes outward from the Sun. Solar flares can be many thousands of miles long, and they can contain far more energy than all of the energy consumption of all of human history on Earth.